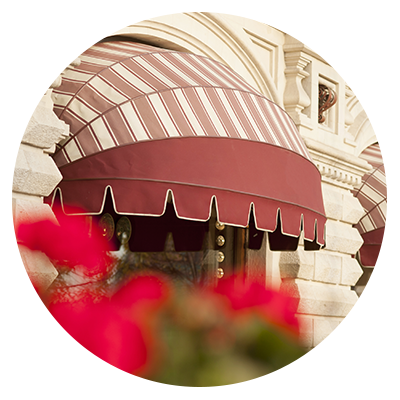 Awnings And Shades - Get Custom Outdoor Solutions In Van Nuys | Van Nuys Awning Co. Custom awnings and sun shades are the perfect additions for both homes and companies of all kinds. Not only do they provide shade and protection from the elements, but they also add value and aesthetics to any and every establishment they’re added to. Get your commercial awning or residential awning from the best outdoor solution company in the Los Angeles area at Van Nuys Awning Co. Contact us today to get started on building a custom awning or sun shade of your very own. Whether you’re a homeowner looking to add that finishing touch to your backyard or you’re a business owner trying to provide protection and shade for the customers on your patio, sun shades and awnings are the perfect additions for businesses and homeowners alike. See below for some of the benefits a custom sun shade or awning will do for your home or company, or contact the Van Nuys Awning Co. today to start your custom project. California is well known for its abundance of sunshine, and many business owners love to take advantage of it by offering outdoor seating for their customers. Custom awnings and sun shades will help manage the amount of sun your customers get while they’re outside, giving them an even better experience. Patio awnings, metal awnings, sun shades, and more from the Van Nuys Awning Co. will also draw people into your establishment with great-looking architecture and custom branding that utilizes your company logo and colors. Looking to make the most out of your backyard? Custom awnings and sun shades not only look great, but they can actually help you lower energy costs by keeping sunlight from entering your home and warming it up. Van Nuys uses high-quality materials that are durable, weatherproof, and easy to clean. If you want to add value and looks to your home or company, then a sun shade or awning from the Van Nuys Awning Co. is perfect for you. Contact Van Nuys today to get your free estimate and get started on your custom project today.